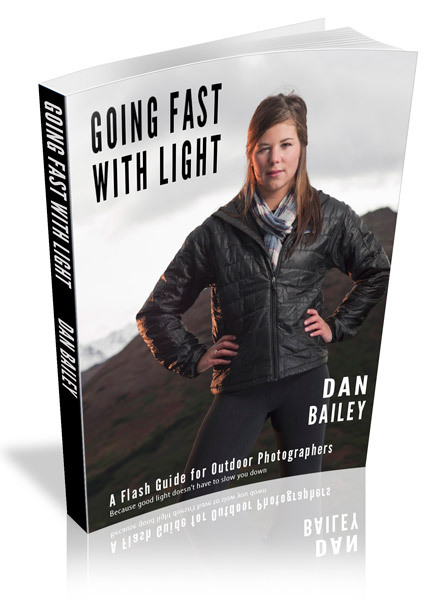 Recently I picked up a great e-book called “Going Fast with Light” by Dan Bailey a professional outdoor adventure and travel photographer from Alaska. It’s all about applying flash and strobist techniques to outdoor photography without having to hire a Sherpa or pack mule to haul your gear around. At first I wondered how flash in the great outdoors where natural light reigns supreme could be useful. This book showed me situations where I may want to utilize off-camera flash techniques in outdoor photography. Here are the key subjects this book addresses: when to use off-camera flash and how to use off-camera flash in outdoor situations and make it look believable. The book starts out with the authors experiences in outdoor photography and the use of external lights. He makes a key point that he is not replacing natural light in his images but merely supplementing in order to improve the quality and diversity of his images. I think that is a great distinction to keep in mind when thinking about where off-camera flash will play a role in your outdoor photography. Does it add to the image or distract the viewer from the image in an unnatural way? The section on gear is pretty good. Dan talks about both Nikon and Canon flashes and various ways to trigger those flashes (synch cord, another flash, infrared, radio triggers, and wireless). I did wish he had talked a bit about the cheaper e-bay wireless triggers like the Cactus v4’s and v5’s along with the Pocket Wizards as they are affordable alternatives but I certainly understand the limitations of including the multitude of equipment that is out there. In the gear section Dan discusses various light modifiers such as diffusers and light boxes, mini-softboxes and bounce cards, diffusion panels, umbrellas, reflectors and gels. It’s really detailed and I gained some great knowledge of the various small & lightweight modifiers that are available. The cool thing is every piece of gear Dan talks about is compact and easy to travel with, hence the “going fast” part of the book. There were a few pieces of gear that really caught my eye and I want to mention them specifically because I’ll probably add them to my own gear list. The first is the Octodome NXT by Photoflex. It’s an 18” eight sided dome. The kit comes with the speed-ring and flash bracket and weighs in at less than 2 pounds. I already use the Lumiquest Softbox III so the Octodome would be a nice addition to my modifier family. The other piece of gear that I had never really considered before are clamps. When you are outdoors you typically are not going to be packing fancy light stands so you may need a clamp or two to attach your flashes to whatever you can. The Manfrotto Super Clamp looks like a Pitbull on steroids and could attach to just about anything. I’ll be adding this to my arsenal. The next section talks about flash basics, including different metering modes, synch speed (including high speed synch) and using multiple flashes. Dan provides a basic workflow to get you thinking about how to analyze the scene and plan out your exposure. I really learned a lot from this section and have referred to it more than once. One of my favorite sections of the book is the Solving Problems section where Dan lays out some typical situations where using off-camera flash can take your photos to the next level. Some of these include: reducing contrast (think shadowed foreground subject against a sunlit background); fill light; forest scenes; sunsets; how to overpower the sun and creating motion in your images. I learned so much from this section and it answered many of the questions I’ve had and problems I’ve experienced. The book wraps up with what I like to call the “Creativity Section” where topics like using colored light, halo/rim lighting and other techniques are discussed in detail. Overall this is a fantastic book for learning about off-camera lighting in outdoor/adventure situations. I would say it’s target audience would be someone who is just starting to explore off-camera lighting techniques. It’s a wealth of information, examples and great photos. If you want to learn how to go fast with light then check out this book. It’s available in e-book format (PDF) as well as on Kindle. It’s 83 pages of technical goodness for $12.95 or the Kindle version is $9.95.